The Department of Natural Resources utilizes several methods to locate wildfires as accurately and quickly as possible. Members of the public report wildfires on a regular basis usually via the DNR maintained 1-800-565-2224 number as well as 911. The information that is received is usually very accurate and in most cases, reported during the early stages of the wildfire. During periods of high to extreme fire hazard, fixed winged aircraft are used for aerial detection. 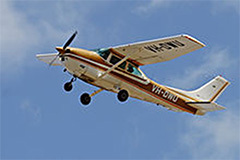 These planes fly predetermined routes in the areas of the province that are experiencing elevated wildfire risk due to weather conditions. These flights are arranged for each day they are needed by the provincial fire duty officer. The aircraft are equipped with GPS locators. When smoke is spotted the plane flies to that location and the duty officer can see exactly where the wildfire is by looking at the tracking monitor which shows a map of the province and the location of the aircraft. The pilot is able to communicate to the duty officer the fire size, the type of fuels burning, any values that might be threatened and if there is any suspicious activity around the fire. The duty officer can use all of this information to plan the response to the wildfire. The average response time to a wildfire in Nova Scotia is 20 minutes, giving us a response time that is the envy of many other agencies across the country.